After spending a ridiculous amount of time searching for a large blue rug, I finally decided on the dhurrie in the center. I can't wait for it to get here. I knew I wanted something bold and graphic, but not too in-your-face. Keeping my fingers crossed that it looks as good as the picture! 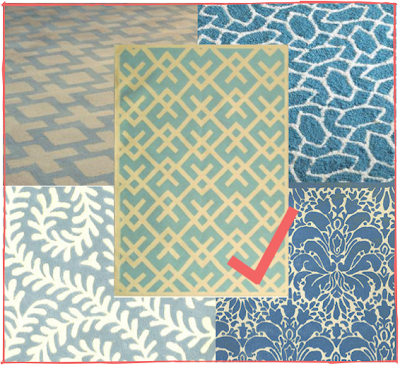 Some other options from top left to right: trellis rug, indoor-outdoor, vine rug, damask. you made the right choice. the middle one is my favourite too! thanks Michele. it seems like the obvious choice now, but oh boy did i hem and haw over this purchase. 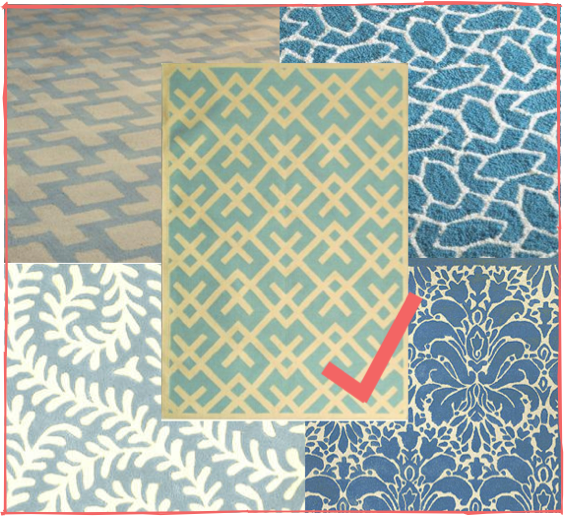 I have bookmarked all your rug sites because I am shopping for some rugs and you have such good taste. Family visiting in October and all our rugs look so worn out after 11 years of children, cats, and dogs.